In the world of education, nearly everyone has an opinion on the Common Core State Standards. Some appreciate the new standards for the rigorous curriculum they encourage, while others feel they may encourage too much rigor and promote teaching to the test. Before coming to any conclusions about the Common Core, it helps to know what it's all about. The Common Core Standards were designed by the National Governors Association and the Council of Chief State School Officers. Their goal was to develop a rigorous set of standards that would prepare students in kindergarten through 12th grade for both college and future careers. In addition to these high-ranking officials, the developers sought input from teachers and feedback from national education organizations such as the National Education Association (NEA), the American Federation of Teachers (AFT), the National Council for Teachers of Mathematics (NCTM) and the National Council for Teachers of English (NCTE). One complaint of the Common Core involves how teachers, schools, and districts test how well students perform in relation to the standards. When the Common Core State Standards first appeared in schools, most states continued to use annual exams that did not take into account the new standards. While many states have since designed new annual exams to be aligned with the Common Core, allowing individual states to develop exams for their students means that students in some states could still take an easier exam than students in other states. Some opposed to the standards argue that despite the higher standards and new design, the tests will focus on the same type of questions and tired design states have been using for years. Smarter Balanced is a state-led organization focused on developing assessments aligned to the Common Core. The organization works with 19 different states, including Washington, California, and North Carolina. While no official tests have been rolled out, the organization began field testing its exams in the spring of 2014. The Partnership for Assessment of Readiness for College and Careers has also earned funding to develop Common Core-aligned assessments. The organization works with 16 different states, including Ohio and New Mexico to design assessments which will be officially used during the 2014-2015 school year. Both organizations ran into controversy during field tests, with parents in some schools pulling their children out of the tests and protesting their use, arguing that the tests put too much stress on students who hadn't been adequately prepared to take them. While these organizations work, numerous educational publishers and test creators have designed materials and assessments aligned to the Common Core. For example, the Measures of Academic Progress (MAP) tests that many students take in elementary and middle school have been re-designed to incorporate Common Core-aligned questions. Another major educational publisher, Pearson, has begun to design materials and assessments to help teachers implement and assess the Common Core. CTB/McGraw-Hill has also developed the Acuity Assessment and Tests designed to determine academic readiness and measure progress in students in grades three through eight. The College Board has also begun to work to align its assessments with the Common Core. ACT has announced similar plans. This means students in states that have opted not to adopt the Common Core could face a disadvantage when it comes to taking these national exams. In states such as Alaska, Virginia, and Minnesota, lawmakers felt their own standards either far exceeded, or already aligned with, the rigor and high expectations of the Common Core, while states like Texas and Nebraska remained skeptical about the federal involvement in education and the quality of the standards as a whole. However, even the states that originally implemented the Common Core may not stick with the standards. States such as Indiana have begun to analyze the implementation of the Common Core, and its effects, in order to determine whether to stick with the newer standards or go back to their previous standards. Along with the adoption of the Common Core have come many misconceptions about the standards. Of all of the misconceptions, the main misunderstandings can be broken down into two main areas. While the Common Core focuses on a national set of standards to help provide all students with a high-quality education, how students learn those standards and the materials they use will differ. Individual states, districts, and even teachers have the opportunity to decide what curriculum students will use, the books students will read, and even the types of tests they will take, papers they will write, and projects they will complete. While organizations have been working on a national test to measure student progress with relation to the Common Core, the day-to-day teaching still remains in the hands of the teachers. However, states that do not adopt the Common Core may lose out on federal funding opportunities. The absence of a national test to measure the Common Core helps show that the focus of the standards is not testing. In fact, because the standards encourage higher-level thinking and problem-solving skills, teachers are encouraged to incorporate more unique learning activities that allow students to demonstrate those skills. This includes using experiments, real-life simulations, papers, and projects to assess students. However, the goal is still to create a national assessment to help determine how well students perform within relation to the standards. Students will make sense of math problems and persevere in solving them. Students will reason abstractly and quantitatively. Students will model with mathematics. Students will use appropriate tools strategically. Students will look for and make use of structure. Students will look for and express regularity in repeated reasoning. These eight key skills encourage students to think critically about problems, focus on solving real-life problems, and learning to come up with solutions to complex problems on their own, selecting the appropriate tools and explaining the process they used to come up with the correct answer. Common Core math has gained attention for promoting multiple ways to solve problems and difficult homework assignments. While children have difficulty with the new skills, parents have even more difficulty because the new ways children add, subtract, multiply, and divide are not the ways they were taught in school. In order to help their children succeed with the Common Core math, they must look beyond the strategies teachers expect kids to use and focus on the overall goals of the standards. 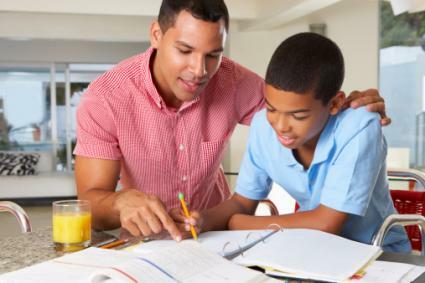 The Common Core Mathematics Standards focus on problem-solving and critical thinking and parents can emphasize these skills at home by giving their children a chance to regularly solve real-life math problems. This includes letting children figure out how much food to have for a small dinner party, determining what products they can afford at a store, or even how much space they need for planting a garden. It also includes pointing out patterns and shapes and letting children see how math appears around them. For parents who have trouble coming up with examples and activities, the Council of the Great City Schools offers road maps with suggestions of how to support children's math skills at every grade-level. Each of the six main areas is then broken up into clusters and anchor standards. For example, in Reading: Informational Texts and Reading: Literature, students focus on areas such as key ideas and details; craft and structure; integration of knowledge and ideas; and range of reading and level of text complexity. At each grade-level, all of the individual standards have been written to fall under those clusters and anchor standards, gradually increasing the complexity of the tasks students complete. So in kindergarten students may be required to "ask and answer questions about unknown words in a text" (CCSS.ELA-Literacy.RL.K.4), but by third grade the same standard asks them to "determine the meaning of words and phrases as they are used in a text, distinguishing literal from non-literal language" (CCSS.ELA-Literacy.RL.3.4) and by eighth grade they must "Determine the meaning of words and phrases as they are used in a text, including figurative and connotative meanings; analyze the impact of specific word choices on meaning and tone, including analogies or allusions to other texts" (CCSS.ELA-Literacy.RL.8.4). Before the Common Core, many English tests would include basic questions asking students to name the main characters in a novel or demonstrate a basic understanding of what happened. When it came to grammar, students would identify parts of speech or complete basic worksheets involving elements of grammar. Instead of the basics, the Common Core helps take ELA instruction further. For example, instead of simply identifying the characters in a text, as early as first grade, the standards encourage students to discuss the characters and their differences. For every answer, teachers expect students to provide evidence. So instead of saying "I liked this book," students must expound upon their answers saying "I liked this book because..." and offering a specific example from the text. In grammar, instead of working on standalone grammar worksheets, students analyze how the parts of speech and other elements of grammar appear in complex text and start to use these components in their own writing. One of the best ways to help children with the Common Core ELA standards at home is to read with them and ask them questions. The range and complexity of texts children read plays an important role in the standards, so move beyond the traditional picture books and novels that children love and, instead, have the read a variety of texts, including the newspaper and magazines, cookbooks, junk mail, labels, signs, and any other texts that come into your home. As they read, ask them questions about what the text is saying, what it means, how it makes them feel, and how it connects with other texts and experiences. With so many different opinions on the Common Core floating around, it's important for parents to develop an understanding of the standards and come to their own conclusions. Even if you find yourself against the standards, chances are your children spend their days in schools where the teachers teach the Common Core. This means it's not important to understand the standards, but also to learn how to help your children understand these new standards and the skills they promote. Take time to talk to your children's teachers, look over their assignments, and know what your children are learning in class. When you know what your child is doing in school, you're more prepared to support them in that learning at home.